Back in 1988, the Libyan dictator Khadaffi sent several terrorists to Scotland, where they planted a semtex device into the cargo hull of a PanAm flight from London to New York. The flight exploded over the small town of Lockerbie, killing 259 mostly US citizens. One of the men convicted for this act, Libyan terrorist Abdelbaset Ali Mohmed al-Megrahi, was allowed ‘on compassionate grounds’ in 2009 to return home as it was determined that he had terminal cancer. The Scottish courts were warned by the US government that he was ‘faking’ his pains. In scenes that the then US President Obama had warned the Libyan government, he did not want to see, Mr Megrahi disembarked at the military airport in Tripoli where his plane landed and several supporters, some wearing T-shirts bearing his picture, threw flower petals in the air and waved Libyan flags while music played. The Scottish court had been played and they knew it. As we told you 2 weeks ago, the German government deported a known terrorist of the 9/11 bombings to Morocco as they didn’t want to risk him being seen walking freely in Germany as his time in court was ending. Unfortunately, the Moroccan government had arranged for him to be brought back with a holiday charter, leading to many unfortunate pictures in the German press at the time. Related coverage: <a href="https://thegoldwater.com/news/39510-Germany-Convicted-9-11-Terrorist-Sits-Smiling-On-Plane-Deporting-Him-To-Morocco-Video"> Germany - Convicted 9/11 Terrorist Sits Smiling On Plane Deporting Him To Morocco (Video)</a>. 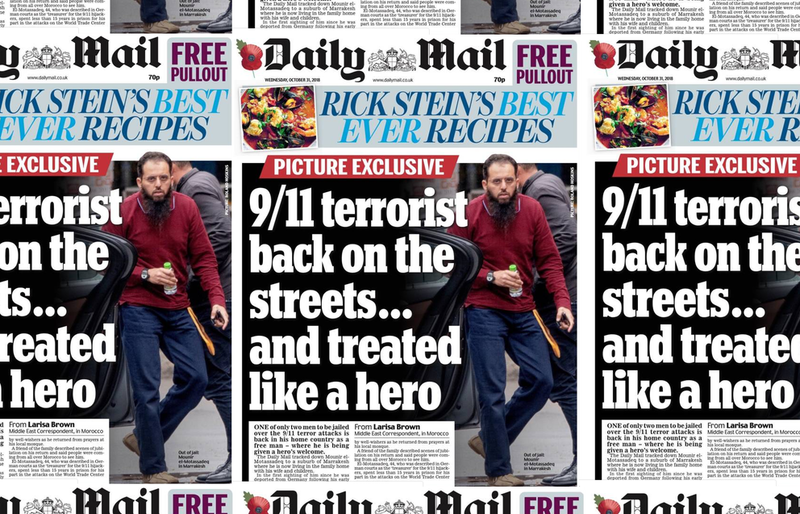 The biggest UK tabloid, the Daily Mail, has now tracked down Mr Mounir el-Motassadeq (who lived with known terrorist Mr Mohammed Atta in Hamburg at the time) to a suburb of the Moroccan city Marrakesh. The assumed terrorist of 9/11 is now living in the family home with his wife and children. The journalists of the UK press stated that he was greeted by well-wishers as he returned from prayers at his local mosque. 44-year-old Mr El-Motassadeq was described by the German courts as the 'treasurer' for the 9/11 hijackers and the man who handled the funds that led to the training of the others as pilots. This time round in Morocco, he could be seen getting into a BMW with his bearded brother. There was no obvious surveillance at the property, although Moroccan police sources assured the German authorities that he would be watched. These attacks will keep happening fos as long as we pretend these folks are human. Not until they are wiped out can we know peace, and should they wipe us out first, they will turn on each other in perpetual war. We might lose, but they will neber win. JEWS DID 9/11 NOT ARABS! go to scholars for 9/11 truth and justice and lawyers committee for 9/11 inquiry. the fake news is covering for the REAL 9/11 scumbags who are BushCo and Silverstein et….. go to youtube and watch Larry Silverstein talk about 9/11. THIS IS ONE OF THE TERRORISTS who made over 4 billion dollars when the Trade Towers collapsed. A 9/11 terrorist is free walking the street? Our 3000 people who died on that day arent walking free. It took a Marine (General Smedley Butler) to stop Prescott and and his little band of scum. And then we elected Prescotts progeny to the White House for a total of 12 years. We need to send a team in to get this guy. A little hollow pointed justice.